Great Britain continued their preparations for this year's Olympic qualifying event with a second win in two days against Japan in London. Alex Danson scored twice for the second successive day, with Laura Unsworth, Helen Richardson-Walsh and Sophie Bray also netting in the 5-1 win. GB compete for a place at the Rio 2016 Games when they travel to Spain in June to play in the World League. Japan, who lost 2-1 on Sunday, replied through Akiko Kato's deflection. 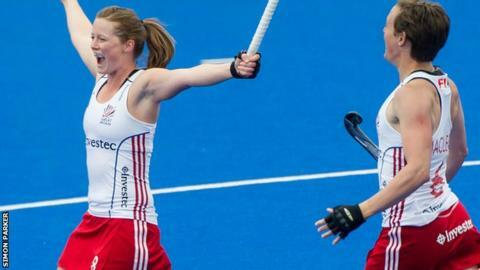 Danson, GB's leading scorer, has now netted 80 international goals since making her international debut aged 16 in 2001. Great Britain head coach Danny Kerry: "These are ideal games for us ahead of the Olympic qualifiers. Japan are a very disciplined side, very good in defence and have good counterattacking threats. It's about concentrating for the whole game and it was perfect for us. "It's good to get into the mindset of bringing your best game to every moment of the match so these types of series are good for that. Hopefully it will stand us in good stead for the upcoming challenges."